Cloudy water blocking the view of your fish? A water clarifier might be the exact product you are looking for. A few drops is all it takes to see visibly clearer water in just a few days! Want to know more? 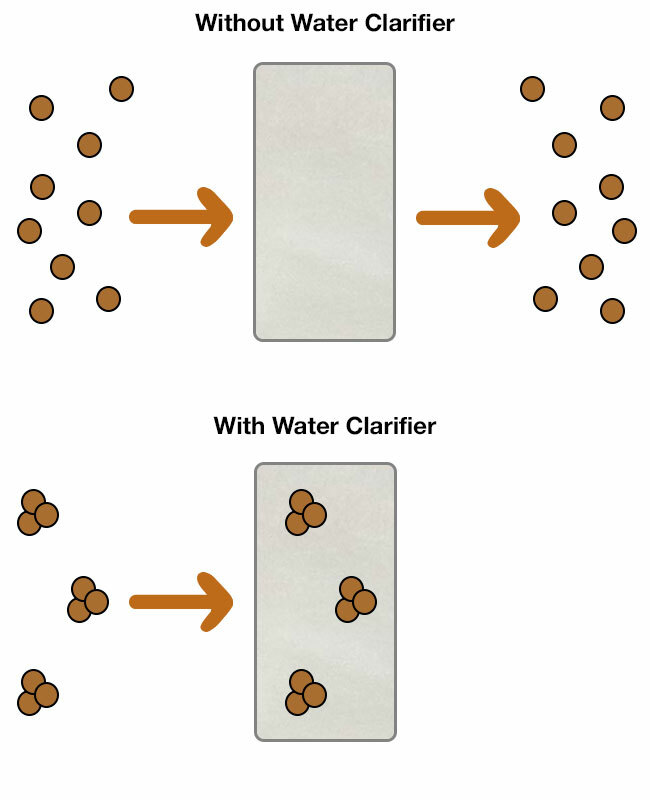 Today, I am going to teach you everything you need to know about water clarifiers. What is a water clarifier and how does it work? What does (and doesn’t) a water clarifier work on? Are water clarifiers harmful to your fish? Why did my water clarifier make my aquarium even cloudier? You see that cloudy water in your aquarium? It may surprise you to learn that the cloud is actually made up of millions of tiny particles. These particles could be anything – algae, dust, sediment, tiny pieces of uneaten fish food. Why doesn’t your filter remove these particles from your aquarium? Well, these particles are tiny. Really tiny. In fact, if you take a single particle and place it on your finger, you wouldn’t be able to see it. It’s this small size that is the problem. You see, these particles just slip right by your filter. But if they were bigger, your filter could trap them, right? To put it simply, when you add a water clarifier to your aquarium, it makes any particles floating around your water sticky. As the tiny particles bump into each other, they glue together – forming a clump. Think of it as rolling a snowball down a hill. It might start off tiny, but it quickly grows in size as more and more snow sticks to the ball. Eventually, the clumps of particles become large enough that they can no longer pass through your mechanical filter. This is easy to understand with a diagram. Water clarifiers work instantly, and you should notice sparkling clear water in just 72 hours. Now that your filter can remove these particles, your water will look visibly clearer. And, it’s all thanks to the water clarifier. While a water clarifier is an effective solution for cloudy water, it is by no means a silver bullet. My experience is that a water clarifier typically works best on organic substances. What are organic substances? Sand, dirt, plants – including algae. Any of the above will happily clump together when exposed to a water clarifier. But you know what it doesn’t work so well on? Bacteria. When it doesn’t work, they blame the water clarifier for not doing what it claimed. Fortunately, bacterial blooms go away without any effort on your part. But if you really want to speed up the process, a UV sterilizer is the way to go. I would also add that if your water has turned brown and murky due to neglect, no amount of water clarifier is going to save your tank. Go back and get the basics right! You don’t have to go far to find stories of people who added water clarifier to their aquarium only to wake up the next morning and find that all their fish were dead. Unfortunately, these are just that – stories. However, I can recall two personal experiences from my 30 years of fishkeeping, starting with my former neighbor. My previous neighbor was a beginner hobbyist, and a lazy one at that. He had an overstocked tank, rarely performed water changes and the less said about his filter, the better. His aquarium was more like a torture chamber than a home for fish. Not wanting to see his fish suffer, I had been over a few times to test his aquarium and maintain it for him. My test kit often revealed shockingly high levels of ammonia. Anyway… long story short – he added a water clarifier only to find that a week later that all his fish had died. Now to me, given the state of his tank, I was amazed it took this long to happen. But to him, it came as a total surprise. He thought back to the last product he added to the aquarium and immediately blamed that – the water clarifier. Another experience was at my son’s school. An aquarium was donated to the school, and I regularly maintained it because I had all the equipment and skills – it was my way of giving back. At one point, the aquarium turned cloudy. Rather than wait for me, the teacher went out and bought a bottle of water clarifier. She added it to the tank and within days, all the fish died. The problem? The school had soft water. This water conditioner said that you should use half the dosage if you add it to soft water. The teacher, not knowing any better, added a full dose and then some. Now, I’m not saying that everyone who claims a water clarifier killed their fish did something wrong. But at the time of writing this, there isn’t any hard evidence to state that a water clarifier will harm your fish because it hasn’t been widely studied. I’m not going to outright say that it won’t kill your fish, but claims that it will are in the minority. Thousands of reviews across the web preach the effectiveness of water clarifiers. I would also add that some brands boldly claim that their water clarifier is safe for fish, going so far as to print this statement in large print on the front of their bottle. If you are going to use a water clarifier, follow the instructions to the letter and wait at least 48 hours after using other chemical products, such as medications or water conditioners. Most of those clumped particles are going to be trapped by your filter. So, take a glance at your filter media, and if it looks excessively dirty, give it a good rinse. Don’t forget to use dechlorinated water when doing this, or you’ll kill the beneficial bacteria in your filter. The rest of the particles that clump together will fall to the bottom of your aquarium. So, grab your gravel vac and give your substrate a good going over. Need a good gravel vac? Check out our best gravel vacuum guide where we test and review over 40 different models. If your cloudy water doesn’t return, then that’s all there is to do. But if your cloudy water returns, you’ll want to figure out why. If you don’t, you’ll constantly need to buy a water clarifier just to keep your aquarium looking clear. This is perhaps my biggest complaint about using water clarifiers – many beginners use it to hide the cloudy water rather than solve the problem. That cloudy water is there for a reason and is a clue that something isn’t right in your tank. It’s like taking pain killers if you have a broken leg. Sure, it will help for a bit, but you still have that broken leg once the pain killers wear off. So, if you find your cloudy water coming back time and time again, it’s time to put on your detective hat and start investigating. If your tank is in perfect order, then you won’t need a water clarifier in the first place. Water clarifiers have one job – to make the water in your aquarium crystal clear. If you have never used a water clarifier before, then you might panic if it actually makes your water look cloudier. Don’t worry, I did the same the first time I used it! If you stop to think about it, it actually makes sense. As the particles clump together, they become larger and more visible. This gives the appearance that your cloudy water is actually worse than before. Unfortunately, this is just a part of the clarification process. So sit tight… Things are going to look worse before they get better. The only exception is if you add too much water clarifier. 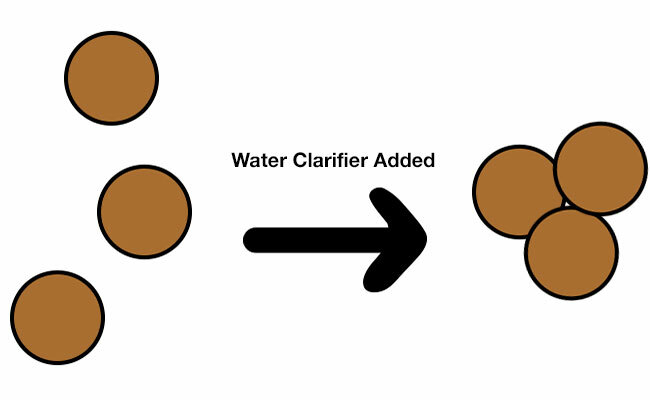 If this is the case, your water clarifier is going to go on a clumping spree and will very likely turn your water a cloudy brown color. If you use one of our top picks, an overdose should be harmless and sort itself out in a few days. Just go easy next time, okay? If you want to attack that cloudy water quickly, then it’s important that you choose a good one. Below are two of the best performing aquarium water clarifiers on the market, leaving you with crystal clear water. 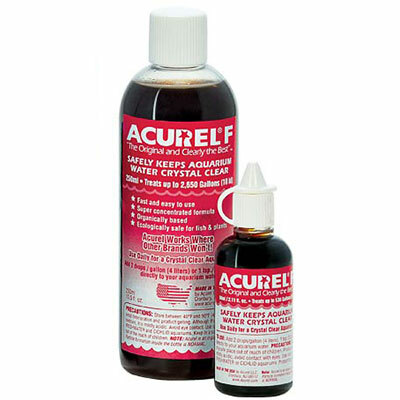 Acurel has made water clarifiers for over 45 years, and their freshwater aquarium clarifier is second to none. Available in a variety of sizes, this clarifier is capable of treating up to 2,650 gallons of water. Best of all, it’s organic and made right here in the USA. And, it’s my top pick if you want your freshwater aquarium to sparkle. If you follow the instructions, then Acurel F is your ticket to clear water. Let me repeat that. Follow the instructions. Before using this product, I highly recommend ensuring that you have adequate aeration in your tank – surface agitation is important. If you don’t, keep an eye on your fish, and if you notice them gasping for oxygen, perform an immediate water change. When used correctly, Acurel F is safe for freshwater fish and plants. It works so well that I wish they made a saltwater version. With so many different particles, algae and dinoflagellates floating through your saltwater aquarium, the thought of adding a water clarifier likely makes your stomach churn. 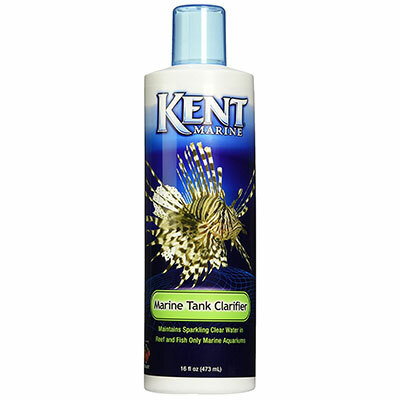 If you have to go down the water clarifier route, then Kent Marine Tank Clarifier is as good as it gets. 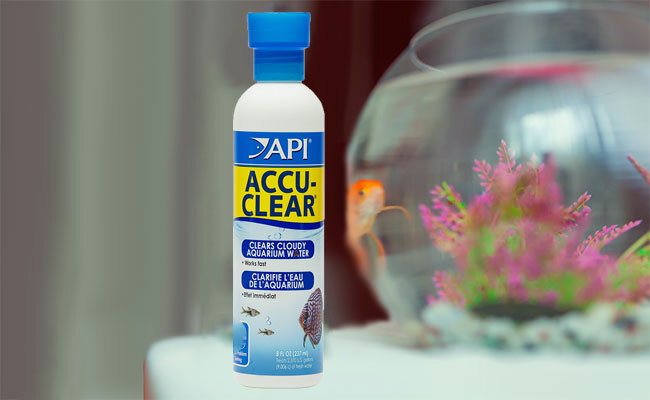 Safe for your corals, anemones and whatever else is hiding in your reef, this water clarifier only clumps together the unwanted gunk that is floating around your aquarium, leaving you with noticeably clearer water. 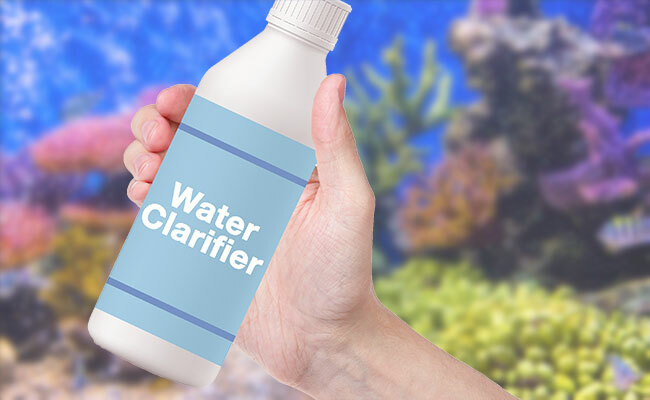 And don’t worry, it doesn’t contain any nitrates and phosphates – many aquarists use this water clarifier as part of their regular maintenance schedule. As always, when adding any chemical to your tank, follow the instructions closely and keep an eye on your water parameters! Water clarifiers are a quick and affordable solution to some causes of cloudy water, particularly sediments and loose sand. But it’s only a temporary one! If you don’t fix the cause of your cloudy water, you will be stuck in a cycle of consistently adding a water clarifier every time it returns. I highly recommend fixing the problem and only using a water clarifier as a last resort. If you are looking for other products to fix your cloudy water problem, I personally recommend a fine filter media like a polishing pad for physical objects like sand or a UV sterilizer for living things like bacterial bloom or algae that turn your water green. 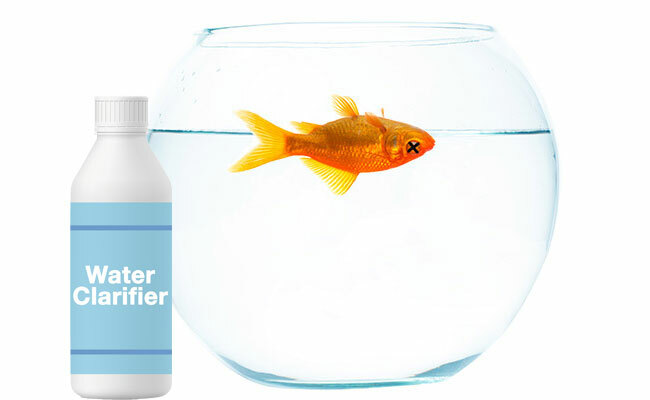 Do you use water clarifier in your aquarium? Let me know in the comments below! Why Are There Mysterious Air Bubbles in Your Aquarium? I rarely use a clarifier, but when I have I have found that the clarifier actually reduces my filters flow by gunking up the pads. Even after rinsing them, the flow is still reduced. Changing out the pads completely fixes the flow issue. Can you use Algae fix with clarity at the same time? We have a huge algae problem that i think was caused by 2 lights being left on in the tank. You would have to reach out to the manufacturers, I have never mixed these two chemicals before. Is it okay to use water clarifier one day and then follow up a couple days later with more clarifier if it’s still cloudy? Is it possible to use too much clarifier? If your water has a recurring cloudiness problem, I would try figure out what the source is rather than relying on repeatedly dosing the tank with chemicals. If you instead want to constantly use clarifier, I would only dose as per the instructions.